If President Donald Trump wants to resolve the nuclear standoff with North Korea by diplomatic means, he sure has a funny way of showing it. If the upcoming meeting between Trump and North Korean dictator Kim Jong-un actually results in a deal to denuclearize the isolated rogue state and restore it as a member of the international community in relatively good standing, it will be perhaps the greatest diplomatic breakthrough in American diplomacy since the end of the Cold War. For all his many shortcomings, Trump would deserve praise for this, in a Nixon-in-China sort of way. Unfortunately, since agreeing to meet with Kim earlier this month (likely without realizing what he was agreeing to), Trump has steadily undermined this goal with every foreign-policy-related word and deed. Hopes were already dim for such a breakthrough, but his two headline decisions announced on Thursday — $50 billion in tariffs on Chinese imports and the appointment of John Bolton as his new national security adviser — may have been the final nails in its coffin. To start with the obvious, Bolton’s reputation as a neoconservative war hawk precedes him. An architect and unrepentant champion of the Iraq War, Bolton consistently prefers the use of force as the primary means of solving America’s problems around the world. In Bolton’s dictionary, cooperation, international law, and multilateralism are all dirty words. Hardly anyone who has carried the title of “diplomat” shares his utter contempt for diplomacy as a means of solving problems in the world. From his last government perch in the George W. Bush administration, as ambassador to the United Nations (an institution he openly despises), Bolton could damage little beyond what remained of the United States’ reputation and international standing. As national security adviser to Trump, however, Bolton may be substantially more dangerous, as he is likely to encourage rather than temper Trump’s worst impulses. Bolton is due to take office April 9, meaning he will have plenty of time at the president’s side to shape his thoughts and actions before the two consequential diplomatic events coming up in May: the meeting with Kim and Trump’s next opportunity to tear up the nuclear agreement with Iran. Bolton, of course, is a long-standing advocate of war with Iran, so the odds that Trump decides to pull out of that deal are even slimmer than they already were. As for North Korea, Bolton was recently seen on television cheering for diplomacy to fail, so that the U.S. can proceed with the war he sees as inevitable and desirable. In a Wall Street Journal op-ed published last month, Bolton laid out his view of the legal case for a preventive strike on North Korea. A month of Bolton whispering in Trump’s ear that the North Koreans and the Chinese (and the Russians, and the Iranians, and the Arabs, etc.) are congenital liars who can’t be trusted outside the range of a Patriot missile, and these talks become less likely to actually happen and more likely to fail by design if they do. 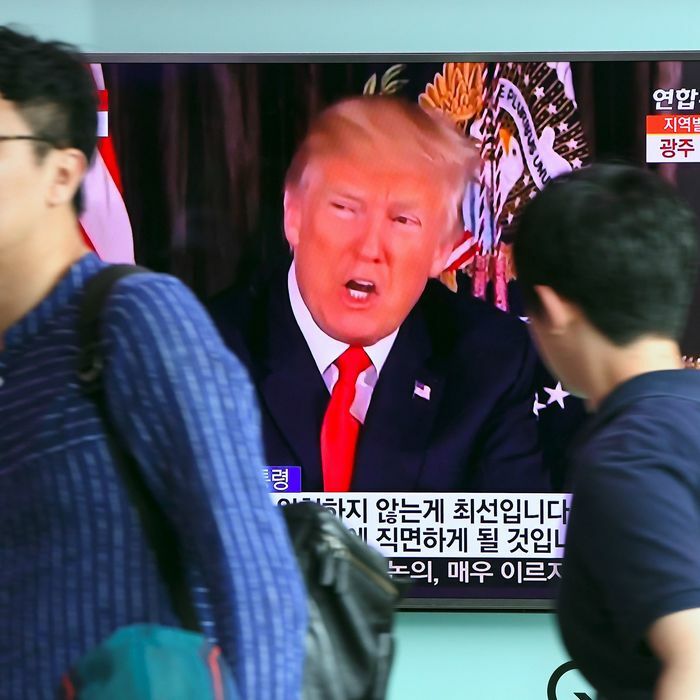 Of course, Trump should not take Kim at his word, but neither should he pass up the opportunity this diplomatic opening presents to avoid war and put North Korea on a path toward denuclearization. If Bolton’s appointment pushes us one step closer to war with North Korea, so too does Trump’s decision to slap China with punitive tariffs. China is a key player in Northeast Asia and the only country that appears to hold any kind of sway over Pyongyang’s behavior. Enforcing any hypothetical agreement with North Korea to slow down, scale down, or dismantle its nuclear-weapons program is inconceivable without Chinese help. China has a strong and sincere interest in resolving the Korean crisis peacefully. No country welcomes the prospect of a war next door, least of all one with a nuclear dimension. A war would devastate North Korea and send refugees pouring across the Chinese border by the thousands if not the millions, particularly if the North Korean state collapses (an outcome Bolton, incidentally, appears to favor). In comments earlier this month, Chinese foreign minister Wang Yi expressed enthusiasm about the potential breakthrough between North and South Korea and encouraged the parties to pursue parallel dialogues on denuclearization and security normalization, addressing North Korea’s legitimate security concerns as well as those of South Korea, the rest of the region, and the U.S.
China’s strategic interests in the Korean peninsula are unchanged by the Trump administration’s trade policy, but it’s hard to see Beijing being eager to help shepherd the best possible outcome for the U.S. and its allies when we are actively engaged in a trade war. Whether we like it or not, China is a major global power just like the U.S. and has lots of options for making things difficult for Washington if it so chooses, from blocking our initiatives in the U.N. Security Council to building new frameworks for international trade in which the U.S. is not a leader or even a participant. An administration less fixated on zero-sum fantasies of foreign trade and international relations might take the opposite tack and make a deal whereby China quietly ends some of its unfair trade practices in exchange for the U.S. agreeing to put all parties’ security concerns on the table in the Korea talks, not just those of our side. At the very least, a government with a less one-sided worldview might have the sensibility to treat China like a formidable rival and potential partner worthy of respect, rather than a misbehaving child that can be easily pushed around. Instead, the Trump administration is antagonizing China at a moment when we could really use its cooperation in solving the world’s most pressing security problem, while welcoming an adviser who sees a catastrophic war as the only viable solution to that problem. Just as Trump was beginning to steer the U.S. away from its collision course with North Korea, he has taken a violent turn back toward it.